I have a Noodles Valentine's polish to share with you today. I had no intention of buying any Valentine's nail polishes, but I saw some of Noodles' offerings and I caved. It's like Noodles Nail Polish knows my taste in nail polish. Everything they create I love! Love Struck is a pink tinted jelly base with magenta glitters and cherry, purple, gold and pink holo glitters. 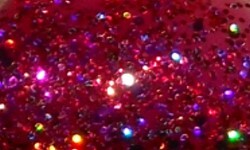 Color: This is an awesome glitter bomb! I love the intensity of this pink color. The intensity of the holo glitter in this is awesome too. I love the use of purple and gold in this blend as it gives the color a lot of dimension. Formula: Excellent full coverage glitter! I used 2 coats. This applied easily. Price: This is $9 on Noodles Nail Polish etsy site. Overall: Love Struck is an amazing jelly holo glitter. I love the blend of pink and purple shades to create this overall look. The holo factor in here is intense and the formula was great and easy to use.